New media and communication technologies have expanded both our object of study and the range of techniques for teaching our students, but powerful gatekeepers remain. From corporate owners crying foul when we quote from copyrighted material to school administrators haunted by the specter of lawsuits, a culture of fear has descended over teaching in the digital age, bombarding us with a myriad of confusing guidelines and dubious restrictions. Some have pushed back, arguing that our right to access and produce media in educational settings is protected by the doctrine of “fair use” as outlined in Section 107 of the Copyright Act of 1976. 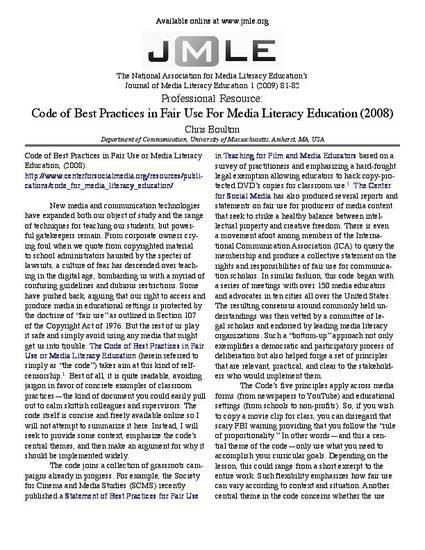 The Journal of Media Literacy Education is an online, open-access, peer-reviewed interdisciplinary journal that supports the development of research, scholarship and the pedagogy of media literacy education. It is the official journal of the National Association for Media Literacy Education.